What's the price of the complete colour set of C350 Bizhub toner cartridges and can you get them to me in Nigeria? Do you have an agent in Nigeria? Unfortunately not. Cartridge Save is an online retailer based in the UK and we can only deliver within this region. Also, we could only guarantee that our Konica Minolta Bizhub C350 toner cartridges would work in the UK version of this printer. Print, copy, and scan with the Konica Minolta Bizhub 350 multifunction printer. The Bizhub 350 office system has a maximum resolution of 600 x 600 dpi and has 256 levels of gradation. It is integrated with 192 MB memory and 300 MHz processor. The Konica Minolta Bizhub 350 monochrome laser printer can handle media as large as an A3 and can continuously copy up to 999 pages. Though PC-fax is offered, the fax kit is optional. This unit measures 677 x 710 x 718 mm and weighs 74 kg. The Konica Minolta Bizhub 350 black and white office professional can handle 1,150 sheets but it can be upgraded to 3,650 sheets. It has a flatbed scanner and offers several optional finishers. The office system Bizhub 350 also has a handy control panel that has function buttons and a display. For connectivity, Ethernet and USB ports are available. Print speed can go as fast as 35 ppm with the first page coming out in 4.8 seconds. The black Bizhub 350 toner cartridge has an estimated print yield of 17,500 pages. 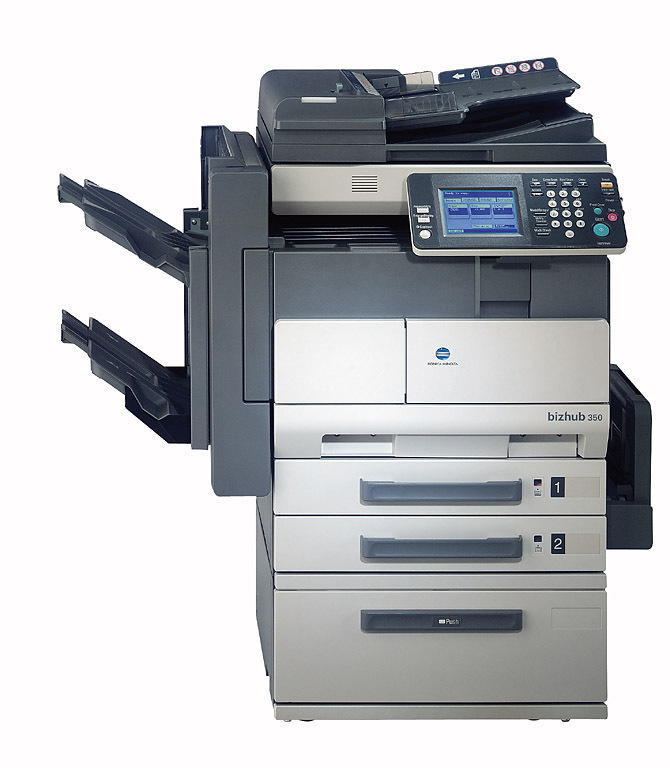 The Konica Minolta 350 mono laser printer has handy features to increase efficiency in the office including an automatic document feeder and a duplexer for double-sided copying. Performance is quick and this unit delivers consistent and professional quality output. Internet fax is offered. The Konica Bizhub 350 all-in-one can scan and copy originals such as 3D objects and books. Networking is easy thanks to built-in Ethernet and the Konica Minolta Bizhub 350's compatibility with Macintosh and Windows computers. This unit could be better if the fax machine was built-in. The Bizhub 350 black and white copier does not offer Wi-Fi connectivity.